Notes: The Vinyl Manual is the 21st century companion for anyone who is bringing their vinyl music collection back to life or discovering the joys of vinyl for the first time. With chapters on turntables and audio kit, it is a step-by-step guide to getting the most from your vinyl collection and understanding the technology behind it. We explain how vinyl delivers the unique sound so loved by audio enthusiasts and its evolution over 100 years, from the 78s of the late 19th century to today's advanced electronic formats. As well as expert insight into setting up your system correctly and guides to choosing the right hardware for your music, the Haynes experts take you behind the scenes of the vinyl industry, including the super-clubs of the 1970s, 1980s and 1990s. We tell you the best way to build and curate your collection, from dance to rock to classical, and provide tips from the world's most respected professionals. 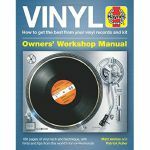 Whether you are collecting, recording or just playing, the Vinyl Manual is the essential companion for any vinyl enthusiast.